Through design innovation, build a future for traditonal textile techniques thereby enriching lives of both artisans and urban consumers. 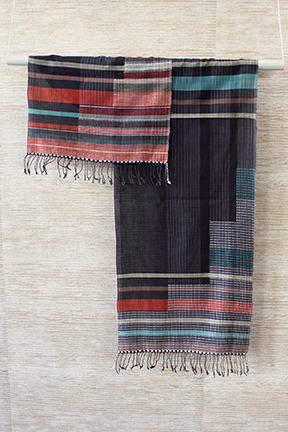 Chelna Desai showcases her handwoven contemporary collection of Stoles in Ikats from South India and Extra wefts from West India for the first time in USA. 4.100% COTTON YARN TIE DYED IKAT STOLE WOVEN BY IKAT ARTISANS OF SOUTH INDIA. CONTEMPORARY DESIGN WITH BOLD WARP MOTIFS AND STRIATED WEFT TEXTURE. 1.100% COTTON EXTRAWEFT STOLE WITH CONTEMPORARY LAYOUT USING TRADITIONAL TECHNIQUE.